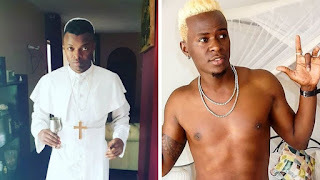 Controversial Gospel singer Ringtone Apoko has changed his mind about suing fellow singer Willy Paul Msafi, barely a week after he announced that he had gone to court. In a post he shared on Instagram, Ringtone said that after a consultative meeting with System Unit’s DJ Mo, he had decided to drop the case he had already filed in court. He went on to say that dropping the case did not mean that he will not take legal action against Willy Paul, if he played with God’s name again. “AFTER A HEATING CONSERITATIVE MEETING WITH ﻿ I HAVE DROP THE CASE FOR ﻿ HOWEVER I WILL NOT SHY FROM TAKE A LEGAL ACTION IN FUTURE IF HE PLAY WITH THE NAME OF GOD. I DARE PLAY WITH GOD AGAIN ﻿,” said Ringtone. In the lawsuit, Ringtone accused Willy Paul of disrespecting the name of God in his latest hit with Tanzanian musician Nandy. Ringtone sought declaratory orders, an apology from the artist and an order to compel the artist to withdraw the offensive music from the public domain. A statement shared by Ringtone, indicated that the lawsuit also intended to prohibit the said artist and others from mentioning religious terms in a manner that was offensive. “The secular song is offensive in its use of some terminology against Christians. As a society the law must balance the right to free expression with other fundamental freedoms such as the right to dignity and choice of religion.” Read the statement in part.